Full Color Flyers, Club Flyers and Sell Sheets. *Free ground shipping on quantities listed, shipping within the continental U.S. Need a Free Custom Flyer Printing Quote or help with your online printing order? Call us at (702) 589-6429 to discuss your Flyer Printing needs. Full Color Flyer Printing At Super Low Prices! Full color, superior print quality 8.5" x 11" and 11" x 17" flyers printed on high quality 100 lb. Gloss Book paper stock at our lowest discounted pricing! We also offer the widest selection of folding options available anywhere! Design your own flyer or have our professional designers create one for you. In addition to standard flyer printing options, we offer many custom printing and finishing options, including custom papers and inks, and design and mailing services. Whether you need 500 or 100,000 flyers printed, you'll find the best quality, better pricing and more options at your fingertips with our flyer printing service. This product is always printed on high-quality paper stock using our top-of-the-line digital and offset presses. Our equipment undergoes daily color calibration to ensure that you receive the best possible flyers at an affordable price. It's easy to make your business stand out with our custom printing services. Flyers are one of the most cost-effective marketing tools available. Whether single or double-sided, folded or flat, fliers printed in rich, full color get noticed! There's no substitute for the impact of 4 color offset printing, and impact is what gets you noticed. That's why we have people dedicated to working with you to guarantee your flyer gets printed beautifully. Flyers can be a key tool in your marketing strategy. They are a great way to feature your event, product or services, especially when placed in high-traffic areas. Our design and production experts provide a wide range of choices for printing flyers, all designed to increase your sales. Flyers can be printed in four color on the font, and the back can be either blank, black or full color. We have many customizable folding options, like half folds, trifolds, accordion folds and gate folds. High-quality aqueous coating is added at no charge, and UV coating is available to give it extra protection and shine, good for attracting attention and surviving repeated hanldling or the elements. You don't have to cut corners to get a great flyer! Give us a call and speak to one of our experienced and dedicated experts about creating a high-quality, full color flyer that gets you noticed and allows you to focus on running your business.You'll be thrilled with our personalized service, fast turnaround and low pricing! We can assist you in creating almost any custom brochure no matter the size, folds, and finishes. If you are looking for a custom printed brochure, we can provide a variety of finishing options including die cutting, foil stamping, embossing and custom folds - just give us a call and we will let you know how to proceed for the best finished product. Club card flyer marketing is one of the most powerful ways to promote your company's products and services anywhere, any time. 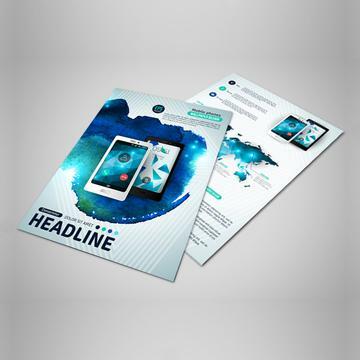 Eye-catching, ultra-glossy flyers command immediate attention, so they're the perfect for quick and influential marketing that drives response. Sales sheets are typically used as sales kit inserts, binder inserts, product guides, handouts, and event materials. These can also be great materials for business presentations, trade shows, meetings and conferences. Our sales sheet printing services come with hole drilling options for easy insertion into binders and presentation folders. We are available 24 hours a day, 7 days a week to accommodate your needs. Click on CONVENTION PRINTING for more info.